18 pp. Roman, 677 pp. 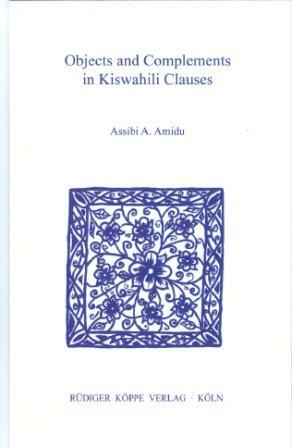 The book looks at the question of objects and complements in Kiswahili clauses. It draws attention to the fact that in Kiswahili, cognate objects are very common because deverbatives or nouns derived from verbs are a central part of the creation of new nouns in the Bantu languages for all categories of subject, object and complements. Next, the book focuses on what objects and complements are in Kiswahili and points out that translational equivalents are often used to dismiss legitimate objects their status as objects or complements in the language. The study also looks at subject-object inversion/transposition and points out that the pattern extends beyond locative inversion syntax and is widespread in Kiswahili and Bantu. Next, attention focuses on passivization. Finally, the study draws attention to the existence of PP arguments that function as objects and subjects just like NPs do. The book concludes that given the weight of evidence, transitivity theory will never be the same again. In conclusion the book is a main of knowledge on Swahili morphology and syntax. It provides a lot of information that lie beyond the core scope of the book. It gives a solid basis and firm explanations to understanding peculiarities of Swahili grammar. The Author takes the language structure as a starting point for his analysis, and rejects the use of translational approach that, in his view is totally inadequate in the descriptions of Bantu languages. Throughout the book, the Author provides evidence for how the analysis based on the English translation turns out false and misleading. Furthermore, the Author shows how acknowledgement of variation and diversity without overlooking uniformity in different languages may contribute to writing better universal grammars. Undoubtedly, the book challenges the traditional descriptions of Swahili grammar and should be of interest not only to linguists but lexicographers, language teachers and students as well.